Are you looking for a competitive advantage in your niche industry? There are many SEO tools you can use to achieve just that. 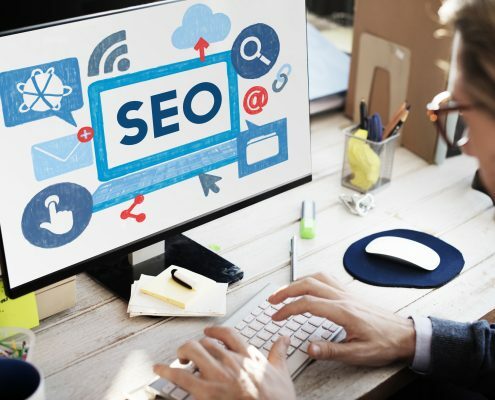 At Rise Atlantic, we offer a broad range of SEO services that will help your business get more organic traffic, and bolster your brand in the digital landscape. Competition is quite fierce today, especially in the digital space. For you to have a competitive advantage online, you need a working strategy that not only optimizes your online presence but also emphasizes on the user experience. Search engine optimization is built on that, and it is the most efficient way to generate organic traffic and achieve high rankings on the search engine results pages. Analyzing the strengths and weaknesses of your competitors to find actionable opportunities is also part of SEO. Here are some of the ways we can help you build a competitive advantage through SEO, and overtake each of your competitors one at a time. Does most of your traffic come from the local community in Fredericton, New Brunswick? One way to get a competitive advantage through our local Fredericton SEO services. We can help you market your business online to reach your targeted audience within the community. • Roadmap development: before we start your campaign, we first create a roadmap based on your specific needs, brand culture, and target audience. We then layout what you want to achieve, and create a comprehensive SEO strategy around it. • Establishing Local Listings: Once we have laid out the roadmap, we set up local pages that reflect your business. • Creating Local Content: As part of the community, we take part in local content creation for Fredericton SEO, which is aimed at generating organic, targeted traffic, which will increase your conversions immensely. • Quality control: we make it a commitment to keep tracking and monitoring your links, ranks, and content, to make sure they maintain the high quality, and to help establish your brand’s authority. Competition in the modern business landscape can be quite scary. But if you want your business to succeed, you have to face it head on. Aside from Fredericton SEO services, Rise Atlantic provides you with an initial competition analysis, which will help us learn the strengths and weaknesses of your competition, determine what to target, and build a strategy around that. • Identifying your Competition: We will help you determine who you are competing with on the SERPs depending on your keywords. We will also offer advice on why the best competitors rank over the others, and how you can outdo them. We also create a list of your biggest competitors, which will help in the prioritization of SEO strategies. • Keyword Analysis: Comparing your keyword phrases with the ones that your competition uses is an important part of our strategy. This will help us understand the keywords you should prioritize to give you a competitive advantage and generate better results. • Links: The competitive SEO approach entails looking at which websites or businesses link to your competition, analyzing their link pattern, and giving you the necessary steps you can take to overtake them. We also analyze your link profile thoroughly to make sure that your site is on the right track. This entails auditing your links, tracking and monitoring the inbound traffic and links to your site, as well as recording all of your outreach campaigns. Adhering to Google’s guidelines and our link clean up will ensure that prospective customers find you at the top of the SERPs and that your online brand’s image is concrete. • Building a Better Incoming Link Profile: We can help you build a better incoming links profile and develop deep linking your internal pages from reputable and high-quality domains. This can provide you with great competitive advantage. Keep in mind that the incoming links are also very valuable for off-page SEO and that links to your social media accounts count too. The editorial links that are acquired naturally when people appreciate your content are powerful, unique, authentic, and are preferable. Once you start earning these natural links, most of your content marketing advantages will pay off very incredibly well. • In-depth Link Profile Analysis: we also analyze your backlink profile with the aim of catching any links that are worth keeping, and ones that you should get rid of. We give you a detailed report in the end and give you recommendations on how to maintain the quality link profile. • Removal Service: Our experts will work with you to eliminate all of the toxic links that we have discovered, by reaching out to webmasters and blog owners. This refers to strategies aimed at acquiring top rankings in the SERPs. We use white hat SEO approaches to help you attain the highly coveted top rankings on search engines. Our experts use proven strategies that outlive even the latest craze and will use every tool available to define your competitive advantage. All this is to help potential customers find what they have been looking for: you. You can think of SEO as a benefit plan for your business. It’s ideally a big picture approach that will propel your brand’s name into the spotlight. • Developing Brand authority: We focus on establishing your organic authority by using the right keywords to bring you highly targeted organic traffic to your site. This eventually turns you into an authority in your niche. • Shares on Social Media Platforms: Having a large number of people who share and follow your branded content on various social media platforms, is a powerful way to get an edge over your competition. It’s important to have the social media sharing widget icons around your site or blog. Always post a link to your social following whenever you publish a note-worthy blog post. Ensure that it’s always easy for others to share the content, and repurpose the content several times. • SEO Plans: A key part of our SEO strategy is working with you every step of the way to establish and reach your goals. Our team will help you build a website that search engines and your customers will love. Our SEO Fredericton service will effectively enhance your online visibility, and make sure the right audience finds your brand easily and put them on the right channel to make a purchase.